As New Year’s approaches you may feel tempted to start making your resolutions but consider the Story of the Swimming Cow before you write that list of changes you want to make. Once there was a cow who lived by the river. The cow chewed on grass in the field and gazed across at the other river bank. Everything looked so much better on that shore. 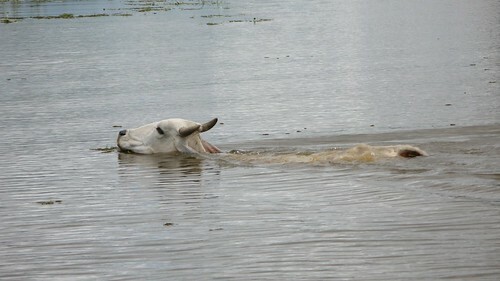 Then one day the cow decided to go for it, and walked into the water and swam and swam over to the other side. The cow got back in the water and headed back to that shore on the other side. The first time I heard the story of the swimming cow was from Alex, from Shanti Yoga Studio, who teaches a wonderful yoga class near me. I’ve told this story to the children I teach too. I love this story because it shows the games the mind plays. Just thinking of this cow, going back and forth, and back and forth, from one shore to the other. Spending all her time swimming, thinking things will be better if only she were on that side, if only she were somewhere else. That’s one of the dangers of Resolutions if you make them feeling you need to be where you are not. The cow shows it’s an exhausting place to be. Resolutions do not interest me much now, though there is a part of me that is tempted to make them. The quiet time after Christmas is conducive to gazing into the distance thinking, “I want to be on that shore.” If only I was thinner, wealthier, or you can fill in your own blank here………. These are things I’ve wished for since childhood. These resolutions come off like begging. They have never been effective for changing anything except tiring me out so when I feel these inadequacies I call on all my Yogic powers to get back on track. That’s not to say I should ignore the feeling of inadequacy, of not being good enough. The Swimming Cow Story is great for a yoga class for kids or adults because it reminds you to get centered and examine your feelings and desires to see if they are really what you want or if they are just habits. The story shows you that you’ve got to manage these desires effectively and not waste time swimming back and forth without getting anywhere. For example one of the most common New Year’s resolutions is to lose weight. Studies show that dieting can lead to weight loss followed by weight gain, a cycle with harmful physiological and psychological effects. Resolutions might also cause a negative yo-yo effect if you are constantly making and breaking resolutions. Rather than setting resolutions consider these options that I’ve taught in my Kundalini Kick Start Workshops in Toronto, Canada. Try looking at the past year, not only what you have done, but what you have learned. Reflect on what went well and what you would change the next time around. Consider not only the facts but also the feelings of the last year. Reflection on the past year is a meditative way to center yourself to consciously set your intentions for the coming year. For the past 4 years in the Kundalini Kick Start workshops we use these 3 hours to both reflect, do yoga, meditation and relaxation, and from this relaxed state we consciously set intentions. Where is your spirit leading you for the new year? Let your intention arise from within and spread outwards. Rather than make a list of what you do not want, think of what you want. What kind of lifestyle do you want to live, what do you want to do and feel? Let yourself dream, and dream as big as you want! For me, my intention is what gets me out of bed in the morning and sometimes keeps me up all night working. What is your passion? Through the practice of yoga you learn your identity is not the way you look or the things you possess. A Yogi’s identity lies in their spiritual identity, beyond time and space, and certainly not tied down to the first day of the new year. A Yogi sets goals based on their spiritual identity. Please see the comments below and share your intentions for the New Year. Do you teach kids about New Years Resolutions? P.S. Here are some yoga poses for a kids class theme using The Swimming Cow Story for New Years. Cat/Cow pose, Downward Dog (eating grass), Upward Dog or Cobra (looking at the other side), Leg lifts (walking to the shore), arm circles (swimming), twists (looking around for help), Standing back bend (reflecting on the past year), Standing forward fold with legs wide (reflecting on the past), Archer Pose/Warrior Two (setting an intention), Warrior Three (holding the intention). It a true honor and privilege to see kids faces light up when you share stories or teach yoga to children. It has changed my life in so many surprising and beautiful ways. If you would like to teach yoga to children, registration is now open for the January 18 start of the 95 hour Yoga Alliance Registered Kids Yoga Teacher Training. Come and get the certification, tools and experience you need to be a Kids Yoga Teacher. Details Here. Share the wisdom of yoga with children. You will be glad you did! Great post. I like the quote “We do not learn from experience, …we learn from reflecting on experience.” It’s so true. That’s why I tried to develop the habit of reflecting myself on what I’ve done every day to see how far I’ve gone and what I could’ve done better. Keep up the spirit. Hoping to stay on my path next year…whatever that path may be. All the best Corinna – yes, whatever the path may be. Thanks for checking the comments. What do you think are some of the ways to teach kids about New Years Resolutions? This year our intention at Young Yoga Masters is to introduce the 200 hr Registered Yoga Teacher Certification program. Stay tuned for details.